As you heat up a piece of iron, the arrangement of the iron atoms changes several times before melting. This unusual behavior is one reason why steel, in which iron plays a starring role, is so sturdy and ubiquitous in everything from teapots to skyscrapers. But the details of just how and why iron takes on so many different forms have remained a mystery. Recent work at Caltech in the Division of Engineering and Applied Science, however, provides evidence for how iron's magnetism plays a role in this curious property—an understanding that could help researchers develop better and stronger steel. "Humans have been working with regular old iron for thousands of years, but this is a piece about its thermodynamics that no one has ever really understood," says Brent Fultz, the Barbara and Stanley R. Rawn, Jr., Professor of Materials Science and Applied Physics. The laws of thermodynamics govern the natural behavior of materials, such as the temperature at which water boils and the timing of chemical reactions. These same principles also determine how atoms in solids are arranged, and in the case of iron, nature changes its mind several times at high temperatures. At room temperature, the iron atoms are in an unusual loosely packed open arrangement; as iron is heated past 912 degrees Celsius, the atoms become more closely packed before loosening again at 1,394 degrees Celsius and ultimately melting at 1,538 degrees Celsius. Iron is magnetic at room temperature, and previous work predicted that iron's magnetism favors its open structure at low temperatures, but at 770 degrees Celsius iron loses its magnetism. However, iron maintains its open structure for more than a hundred degrees beyond this magnetic transition. This led the researchers to believe that there must be something else contributing to iron's unusual thermodynamic properties. 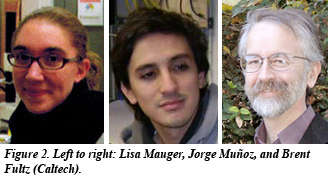 For this missing link, graduate student Lisa Mauger and her colleagues needed to turn up the heat. Solids store heat as small atomic vibrations—vibrations that create disorder, or entropy. At high temperatures, entropy dominates thermodynamics, and atomic vibrations are the largest source of entropy in iron. By studying how these vibrations change as the temperature goes up and magnetism is lost, the researchers hoped to learn more about what is driving these structural rearrangements. To do this, the team took its samples of iron to the High Pressure Collaborative Access Team beamline of the Advanced Photon Source at Argonne National Laboratory in Argonne, Illinois. This synchrotron facility produces intense flashes of x-rays that can be tuned to detect the quantum particles of atomic vibration—called phonon excitations—in iron. When coupling these vibrational measurements with previously known data about the magnetic behavior of iron at these temperatures, the researchers found that iron's vibrational entropy was much larger than originally suspected. In fact, the excess was similar to the entropy contribution from magnetism—suggesting that magnetism and atomic vibrations interact synergistically at moderate temperatures. This excess entropy increases the stability of the iron's open structure even as the sample is heated past the magnetic transition. The technique allowed the researchers to conclude, experimentally and for the first time, that magnons—the quantum particles of electron spin (magnetism)—and phonons interact to increase iron's stability at high temperatures. Because the Caltech group's measurements matched up with the theoretical calculations that were simultaneously being developed by collaborators in the laboratory of Jörg Neugebauer at the Max-Planck-Institut für Eisenforschung GmbH (MPIE), Mauger's results also contributed to the validation of a new computational model. As iron is heated, the arrangement of the atoms in the solid changes several times before the iron finally melts. This unusual behavior is one reason why steel is so strong. The atomic-level details of how and why iron takes on so many different forms during heating remains a mystery, however. Recent work by Caltech CDAC Partner Brent Fultz, current and former Caltech CDAC students Lisa Mauger, Matthew Lucas, and Jorge Muñoz; and HPCAT Beamline Scientists Yuming Xiao and Paul Chow provides evidence for how iron's magnetism plays a role in the melting behavior of iron, and it is this detailed understanding that could help metallurgists develop better and stronger steel. The laws of thermodynamics govern the natural behavior of matter, such as the temperature at which materials melt and freeze, and the preferred direction of chemical reactions. These same principles also determine the most stable arrangements of atoms in solids; in the case of iron, the stable arrangement changes several times with increasing temperature. 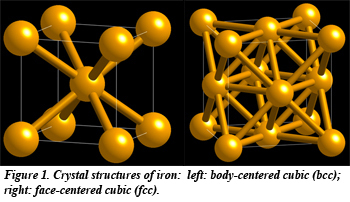 From the room temperature, body-centered cubic (bcc) structure, iron adopts the face-centered cubic (fcc) structure at 912 °C (Fig. 1), and then becomes body-centered again at 1,394 °C, with a larger interatomic spacing, before and ultimately melting at 1,538 °C. Iron is magnetic at room temperature, and previous work predicted that iron's magnetism favors the bcc phase at low temperatures. At 770 °C, however, iron loses its magnetism, but maintains its open, bcc structure well beyond this magnetic transition, suggesting that another effect must be responsible for the unusual sequence of crystal structure preference for iron at high temperatures. Using nuclear resonant inelastic x-ray scattering (NRIXS) spectroscopy at HPCAT, Mauger and co-workers investigated the vibrational properties of iron with increasing temperature. The vibrational properties of materials are closely tied to temperature, and coupling these vibrational measurements with previously known data about the magnetic behavior of iron at high temperatures led to the conclusion that the vibrational entropy of iron is much larger than originally suspected. In fact, the excess vibrational entropy is similar to the entropy contribution from magnetism, suggesting that magnetism and atomic vibrations interact synergistically at moderate temperatures. This excess entropy increases the stability of the bcc structure even as the sample is heated past the magnetic transition. The NRIXS technique allowed the group to obtain the first experimental evidence that magnons (magnetic excitations) and phonons (vibrational excitations) interact to increase the stability of the bcc phase of iron at high temperatures [L. Mauger et al., Phys. Rev. B 90, 064303 (2015)]. Because the NRIXS measurements were consistent with the theoretical calculations that were simultaneously carried out by collaborators in the laboratory of Jörg Neugebauer at the Max-Planck-Institut für Eisenforschung (Iron Research), Fultz and Mauger also contributed to the validation of a new computational model. With a better computational model for the thermodynamics of iron at different temperatures—one that takes into account the effects of both magnetism and atomic vibrations—metallurgists will now be able to more accurately predict the thermodynamic properties of iron alloys as they alter their formulations [F. Körmann et al., Phys. Rev. Lett. 113, 116503 (2015)].